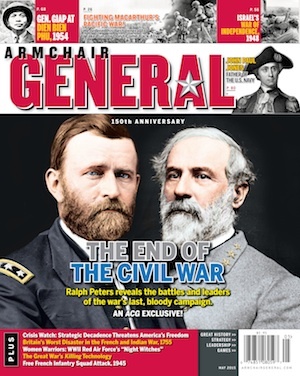 Gary Grigsby’s War in the West – PC Game Review | Armchair General Magazine - We Put YOU in Command! Passed Inspection: Gives players the feel of commanding major operations of ground and air combat. Provides a thorough game manual and training videos to get players into the game. Failed Inspection: The steep learning curve may be off-putting to some players who enjoy turn-based wargames—this is, after all, a Gary Grigsby game. Gary Grigsby. The name is associated with some of the best computer wargames that have been published in the last thirty years. When you hear his name you either prepare for days of intensive wargaming by writing good-bye letters to your loved ones, or you hide behind a game of checkers. The recent release of Gary Grigsby’s War in the West, published by Matrix Games and Slitherine, and developed by 2BY3 Games, lets players command either the Allied or Axis forces in the western front of World War II from 1943 to 1945. Sure, this sounds like just another World War II game—but this is probably the World War II game you’ll play to get a true understanding of what commanders had to consider, from strategy, committing air assets, creating and maintaining the logistics of supplies for units, comprehending the order of battle of your armies, and assigning generals to divisions, just to name a few elements. This is a wargame that is rich in content and information for the player to review, through reports of battles, supplies, unit losses, weather changes, and much more that will be vital for player to be a commander on the wargaming battlefield. Although daunting at first, as with most Gary Grigsby titles, the game manual provides degrees of rules to help those just starting and those who will want to refer to specific rules as they play the game. As the title indicates, Gary Grigsby’s War in the West takes place on the western front; specifically the game map covers all of Western Europe and portions of North Africa, depending on the scenario you play. The unit scale ranges from division to brigades, although some divisions can be broken up to battalion level. The turn scale is weekly. The game can be played singleplayer or with two players. There are two introductory scenarios, which helps ease players into the mechanics of the game. The introductory scenario, Operation Husky, is a seven-turn scenario that can be played as either the American and British or as the Germans and Italians. Players will learn more about the game’s mechanics if they play as the Allies. Upon loading this scenario I was perplexed and intimidated by the numerous menu buttons. However, the developers did a tremendous favor to players by creating an extensive 311-page game manual that covers every rule of game mechanics and function, and a 35-page player handbook that briefly covers the concepts of the game to get you started. Both are available as digital books with the game. The game also comes with five tutorial videos covering air operations, amphibious operations, airborne operations and logistics. This truly brings the rules of how to play the game to the player, rather than the player finding the rules. Another nice addition for those who buy the boxed version is a printed hardcover copy of the game manual. Unfortunately, by using the download version I did not receive a copy of the book to share in this review, but after having the chance to play the game I wish I had. Many games rely on digital manuals today, but this physical manual gives a nice touch to the game where players can sit and read through the rules; after all, it is 311 pages. As I mentioned, the game comes with an introductory scenario of Operation Husky. This scenario will be your best friend as you learn most of the game rules in a short seven turns. I took the advice of many on the Matrix forums to play this scenario several times, to learn from mistakes, and to use the game manuals for reference. Other scenarios are titled: Salerno to Rome 43-44 (42 turns), Battleground Italy 43-45 (95 turns), Breakout and Pursuit 44 (11 turns), Westwall 12 turns, Bulge to the Rhine (12 turns), and three campaigns of the war on the Western Front ranging from 62 to 109 turns. The map is laid out on a traditional hexagonal map grid with each hex representing 10 miles. Map terrain doesn’t limit the movement of units as much as it affects the movement of their supplies, so the railroad system plays a major factor as units advance and attack along the front. Keeping your ground units well supplied with fuel, equipment, ammunition, support and general supplies will depend on how well you’ve created your logistics system for keeping supplies flowing to the advancing front. Players who want to imitate General George Patton by covering as much ground as possible as rapidly as possible will likely find their units running low of fuel. The fighting units for both sides is extensive and true to the order of battle during the war. 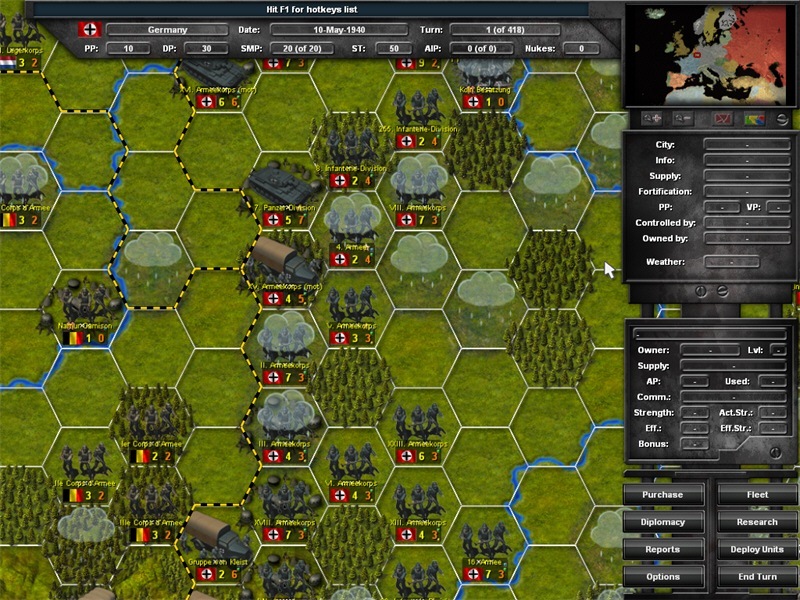 Depending on the scenario, you may be commanding a few divisions or leading the entire Allied or Axis force. Expect to study the order of battle, the commanders who are assigned to them, and the overall function and strength of units to help you formulate your plan against the enemy. Units are assigned to their respective headquarter units and can easily be identified by toggling command lines back to them. This is especially helpful when divisions start overlapping each other on the map. The game provides a detailed report of each unit, providing a table of organization and elements, supply status, morale, and ever-changing combat value. Again, this type of information will be vital for the player when commiting forces in battle or pulling them back to replenish needed supplies and equipment. One of the most interesting features of War in the West is managing the logistics of supplies that are funneled through to your units and designating the priority of which units are to receive them. This gives the player the delicate and essential job of ensuring that the needed supplies go where they are most needed, a situation which is sure to change. Depots can be set up as your units take new ground, or they can be disbanded just before the enemy can overrun them. If things get bad for isolated units they can receive supplies via airdrops. Besides commanding the ground forces in War in the West, players can command the air forces by creating automatic or manual air directives. New players should probably let the AI take care of some of the air war while learning the mechanics of ground warfare in the game. The automatic air directive allows the player to commit some of the air forces to certain types of missions such as ground attacks, air superiority, amphibious support, etc. Alternatively, players can manually create their own air directives for a much more hands-on experience, selecting which air units will conduct the specific missions for those types of directives, as well as whether they will be flying by day or night, defining the altitudes, how often they fly, and where they are conducting their missions. Although War in the West‘s learning curve is complex and steep, it is probably the most straightforward of World War II operational wargames. Once you have mastered the user interface, how to read the detailed reports, and have a basic understanding of the game mechanics you should be on your way to enjoying a well-made game. Players new to the game may feel overwhelmed, not just by the game itself, but by the manual and learning curve. Fortunately, as I stated before, the designers kept this in mind and created a brief Player’s Handbook, tutorial videos, and posted a one-hour play-through Twitch video that can be found on the game’s page at Matrix Games. Expect to find yourself reviewing a lot of information about the status of your units, informational reports, and any intelligence you’ve gathered about the enemy before you actually fight in the game. I found myself going through several cups of coffee with my feet on the table as I covered all of this information before making major decisions of movement and attacks. If you are looking for a fast-paced, turn-based wargame, I would say that War in the West does not fall into that category. Instead, this is a thoughtfully designed wargame that will give you an enriched experience at the operational level. Ed William has his Masters in Library and Information Science and works in public libraries. This allows him access to databases of historical content while reviewing wargames. He took an interest in military history and wargaming as a teenager after discovering that one of his hometown heroes is General George S. Patton. 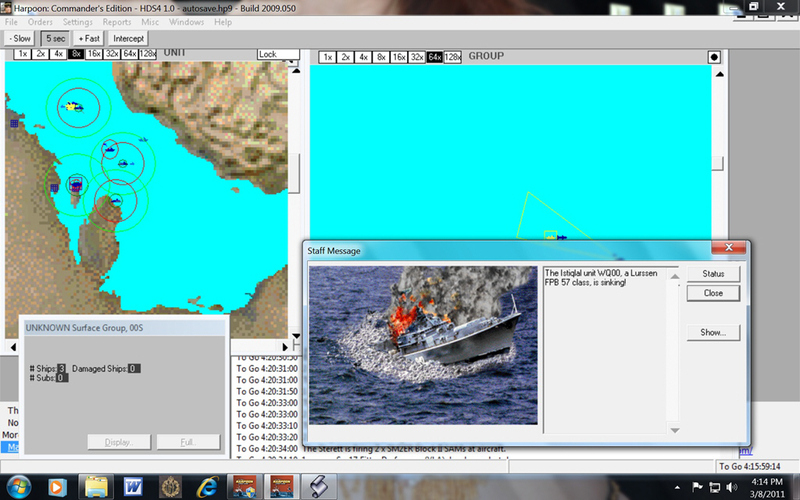 Ed is the author of an article that explains how to convert interactive games in Armchair General magazine to PC scenarios using the Combat Mission series.